Wilt Chamberlain. The mere mention of the Big Dipper's name evokes images of hoops dominance and romantic impossibilities. The man who once scored 100 points in a single game and claimed to have bedded 20,000 women was a fairly enigmatic figure, though, as his huge athletic gifts made him something of a loner throughout his career. As we continue our new series of five things you didn't know about famous people, let's take a look at Wilton Norman Chamberlain. Although Chamberlain is most known for his exploits on the basketball court, he was no athletic one-trick pony. As a high schooler he was intensely interested in track and field, and he continued this passion when he went to college at Kansas University. While at Kansas, Chamberlain won three straight Big Eight high jump championships, ran the 100-yard dash, and could hurl the shotput up to 56 feet. After his basketball career ended in 1974, the Big Dipper picked up a new hobby: volleyball. That year he became a board member of the International Volleyball Association, a fledgling pro coed volleyball league that only lasted until 1979, and brought his intimidating 7'1" frame to the Seattle Smashers' front line. Chamberlain's presence brought enough attention to the league that the IVA's All-Star game was televised. 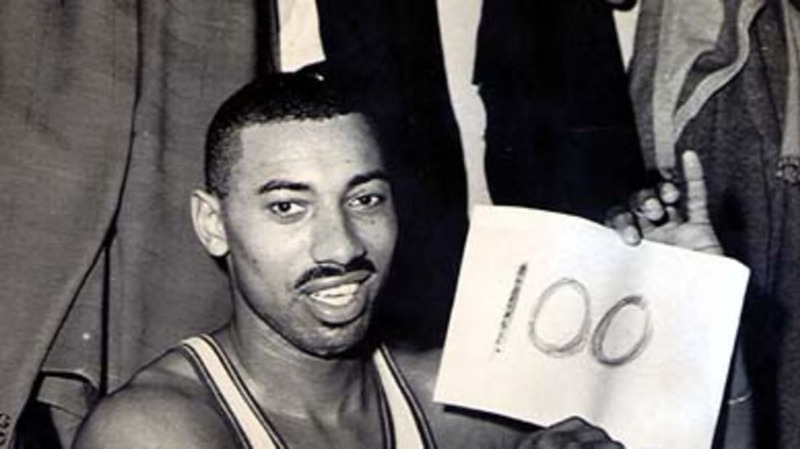 (Of course Wilt won the MVP of the game.) His contributions to volleyball earned him a spot in the sport's Hall of Fame. Chamberlain was notorious for always seeking out a new challenge, but he missed out on one that became one of the great "what if? " scenarios in sports history. According to Don Cherry's biography Wilt: Larger than Life, legendary boxing trainer and promoter Cus D'Amato approached Chamberlain in 1965 with a lucrative offer to box heavyweight champ Muhammad Ali. Philadelphia 76ers owner Ike Richman eventually talked Chamberlain out of the match, but the idea just wouldn't die. D'Amato again offered to train Wilt for a fight against Ali in 1967. In this fight, football star Jim Brown would act as Chamberlain's manager. Although Wilt was taller, heavier, and had over a foot on Ali in the reach department, Chamberlain's father, a boxing fan, warned his son away from the fight. Chamberlain loved cars, and he was known for cruising around in his Cadillac convertible or a custom-made lavender Bentley he'd imported from England. What Chamberlain craved, though, was speed. The only hitch was that he couldn't fit his giant frame into any of the sports cars on the market; he allegedly had to take the seat out of his Lamborghini Countach and replace it with a padded mat just so he could fit behind the wheel. Most people think of Chamberlain as a member of the Lakers, Warriors, or 76ers, but his first pro basketball gig was actually with the Harlem Globetrotters. After losing in the finals of the NCAA tournament during his junior year at Kansas, Wilt wanted to make the leap to the NBA. NBA rules didn't allow players who hadn't finished college, though, so Wilt signed up with the Globetrottters. Financially, Chamberlain probably made out like a bandit by skipping the NBA to head to Harlem. At the time, the average NBA player made less than $10,000 a season, while Wilt's deal guaranteed him $65,000 each year. Chamberlain immediately became the team's top draw; who wouldn't want to watch a seven-footer play shooting guard? After a season of enthusiastically throwing himself into the Globetrotters' skits and shooting, Wilt jumped to the Philadelphia Warriors of the NBA. Chamberlain's famous claim that he slept with 20,000 women first appeared in his 1991 autobiography A View From Above. While Chamberlain was indeed renowned as an incredible pick-up artist and ladies' man, for him to hit such a lofty number he would have needed to bed 1.2 women a day every single day from the age of 15 until he wrote the book. Although the 20,000 feat would have been logistically difficult, Chamberlain allegedly told his on-and-off girlfriend Lynda Huey, "What's a zero between friends? " to imply that the number was actually more like 2,000. According to David M. Pomerantz's exquisite must-read Wilt, 1962, lifelong friend and confidante Lynda Huey thought that number sounded about right.